BeotsMusic has been discontinued as Beats Music is now Apple Music. 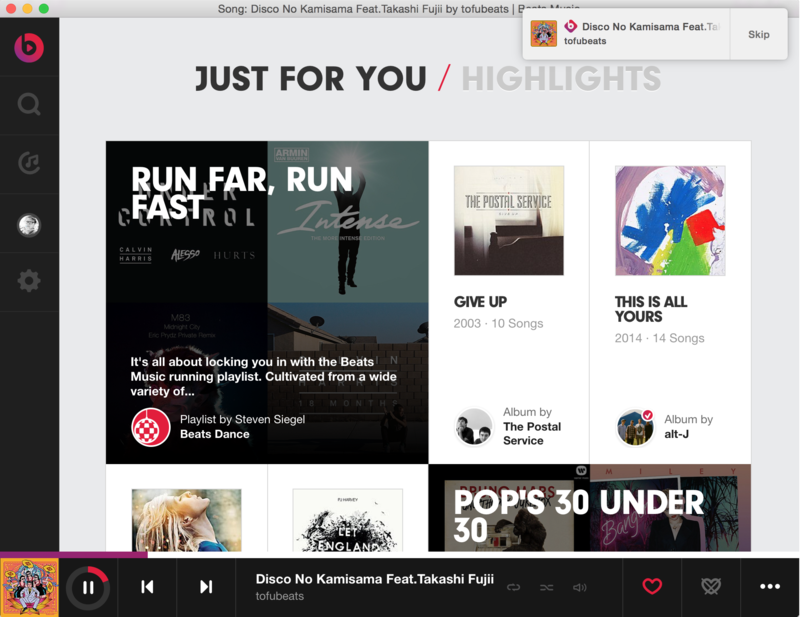 BeotsMusic is a Mac OS X application which brings Beats Music to the desktop without using a browser. No more 'trying to find in which tab is Beats Music running'..
Headphones remote (Apple Mikey) support! BeotsMusic is a weird name. How to pronounce it? I don't know, but you can get a clue from SoundCleod. Download the latest from here. Drag BeotsMusic into your Applications folder. Go to Applications, double click BeotsMusic. Optionally drag BeotsMusic from Applications into the Dock. Important! Minimum required OSX version is 10.7 (Lion). Beats Music the service itself doesn't support keyboard shortcuts unlike SoundCloud. That means, the method being used here is a bit more hackery than the predecessor, SoundCleod. Use at your own higher risk. It might destroy the Earth. Or better don't use it.